August 27, 2014, 10:24 PM · In case you missed it: Part One. On our second day at Kings Island we arrived at about 9am. Platinum and Gold Season Pass Holders are allowed to enter Kings Island 30 minutes in advance of official park opening time which was 10am. During the first half hour several rides in the Action Zone area were open. At 9:30 promptly, everyone is allowed in the park, but once inside you have to flash your Gold or Platinum pass to progress beyond the main hub area. Platinum Passes in hand we sped to Action Zone and while the kids got in line for Banshee my wife and I rented a nearby locker (you cannot take anything loose into the line for Banshee – you have to put your junk in a locker or have a non–rider hold it – yes, this policy is an obvious money grab, but we knew it was coming and we were prepared). If I remember correctly, the locker was $1 an hour with a two hour minimum. We spent the minimum. Locker filled, we hopped into the queue and quickly sped through the line to the front row. 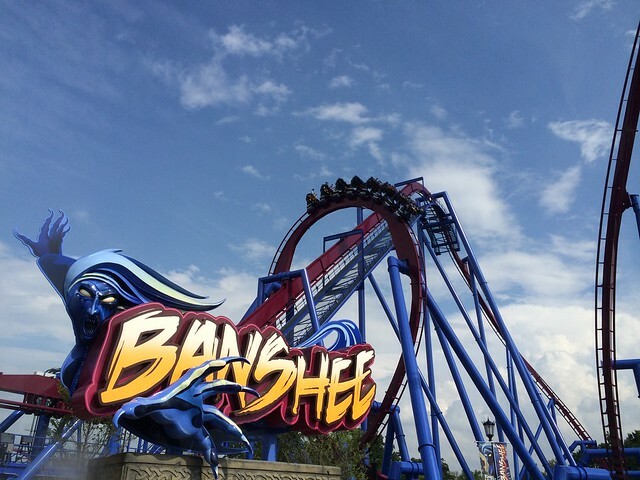 One really great thing about KI is they always seem to run more than one train, and in the case of Banshee there were three trains running even at 9:30 in the morning, which is excellent customer service. We waited one cycle then boarded. Brilliant ride. Just brilliant. We rode again (this time in back), and the kids rode two more times before we headed over to ride the Bat. The back row on Banshee is a much more intense experience than the front, but the views from the front simply cannot be beat. Awesome coaster. The entrance to the Bat is very close to Banshee, but nowhere near the actual ride itself. Honestly, you have to walk about a mile to get to the coaster. I don’t mind a long walk through a themed queue like at Indiana Jones in Disneyland, but the Bat’s drab, concrete walkway is boring! The ride itself is a suspended coaster a lot like the former Big Bad Wolf at Busch Gardens. Overall it is a decent ride over trees and other greenery, with good views of the nearby Great Wolf Lodge, but nothing spectacular. It seems to have been maintained pretty well, but the long walk to the ride probably keeps ridership down even on the busiest of days. I am guessing the Bat is not long for this park - maybe just a few more seasons? Again, not a bad ride at all, but not something to go out of your way to ride either. By then, it was just after 10am and vast crowds were pouring into the Action Zone to ride Banshee. 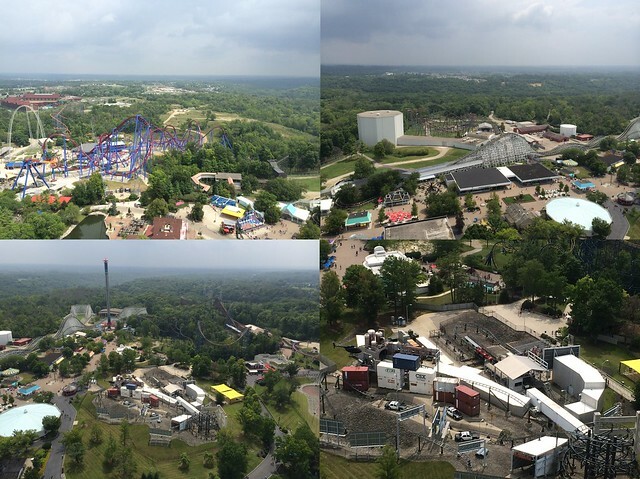 So, we headed out of Action Zone through Oktoberfest and the Coney Mall to the upper left side of the park and X-Base, where Firehawk and Flight of Fear are located. From my discussion with Derek Potter I knew that both of these coasters have very long lines later in the day, so we wanted to knock them out early. When we arrived at 10:05am, they were both walk on, so we hopped on Firehawk first. Firehawk is a flying coaster, but unlike the popular Manta at SeaWorld Orlando, riders are lowered onto the train rather than raised up. So you start the ride laying on your back, then after the lift hill you swoop over and fly like Superman. What a great ride! We loved Firehawk. It was quite an unexpected hit and something we will ride several times when we visit tomorrow. Right next door to Firehawk is Flight of Fear, which is an indoor launch coaster similar to, but not as good as, Rock ‘n’ Roller coaster at Disney Hollywood Studios. I have ridden the version at Kings Dominion in the past and this one at Kings Island (despite being a little better maintained) is the same. The indoor queue with the flying saucer (left over from the old Paramount days) is pretty cool. I would have loved to have visited this ride when it was new, especially if there was a preshow. But a little theme is better than no theme at all I guess. Just like Firehawk, Flight of Fear was a walk on and we nabbed the front three rows (for some reason the back car – both rows – was blocked off – I asked the ride ops about it and they said, “Dunno.” Hmmmm…). Anyway the launch was fun, and the course, outside of the complete dead stop in the middle, is decent. For some reason the lights were on when we rode, which pretty much ruins the experience and makes the darn thing seem very slow after the initial burst of speed. Also, the ride is getting a bit rough, so hold your head back to avoid the head banging effect of the ride. Anyway, we’ll ride again tomorrow and hope for some real darkness. From Flight of Fear we traveled back out into the Coney Mall and headed to the Backlot Stunt Coaster, which is a surprisingly fun little coaster. The first launch into the upwards spiral is a hoot, and the dive into darkness after the helicopter set piece is even better. The attempts at theme and immersion, while leftover from the Paramount days, are commendable for a Cedar Fair park, and I hope they continue to maintain the theming over the years rather than abandoning it like they have on so many other coasters. I recommend this attraction for the entire family as it is more fun than intense, and imminently repeatable. Far as I can tell, it is exactly the same as the clone at Kings Dominion. Do make sure to ride this coaster early in the day, because it pulls large crowds and is somewhat of a slow loader. Next up we decided to brave the old Arrow looper, Vortex. And you know what, it wasn’t too bad. Sure, you can’t completely relax and enjoy the ride or you will end up with a headache, but for an older coaster, Vortex still has its charms. We rode in the front seat, and had a decent enough ride, especially since two trains were running and the ride was a walk on as well. Short waits usually mean decent ride experiences! We headed back down the Coney Mall towards Racer which was only running the red train until noon. Again, with two train operation and crowds still focusing on Banshee, we walked right on and rode. Racer is not a great wooden coaster, and it is a bit bumpy, but overall, we enjoyed it. Later in the day we rode the blue train (and lost) and had more fun. Racing coasters really need that racing element to be fun. When both trains are going, everything seems a bit more speedy and intense. From Racer we headed to Adventure Express, which is a lot like Thunderation at Silver Dollar City, though not nearly as fun. Still Adventure Express is a decent enough ride, a bit jerky and painful for a family coaster, but fun. And even though I warned everyone about the disappointing ending, they were still disappointed there wasn’t “more” after the final lift hill. Me, I kind of liked the ending, and had a good time. I think the final lift hill past the drum beating “natives”/ “gods” / “whatever” is in and of itself the natural conclusion of the ride so nothing else is required. After Adventure Express we headed back to Action Zone to ride Invertigo, a Vekoma inverted Boomerang. Thankfully the ride had just reopened after some downtime, so it too was a walk on. However, after we rode, the lines were already forming and the wait shot up to over 30 minutes – I am not sure why this coaster is so popular because it was really just okay. Definitely better than a standard Boomerang, but nothing worth waiting in line for more than ten minutes – if that. After Invertigo, we had ridden all the coasters except the two youth (not kiddie!) coasters on our list, Flying Ace Aerial Chase and Woodstock Express. We would be skipping the Great Pumpkin Coaster as it is indeed just for the little ones and adults need not apply. But it was lunch time, so we headed back to our locker, got our stuff and headed to International Street (the main hub) to get some grub. The “Main Street” area of Kings Island is really quite breathtaking for an amusement park. There are two wide-open, brick walkways (I think they were brick, anyway – they were definitely not black top or asphalt) flanking either side of a long pool with a good number of fountains scattered throughout. The water in the pool and springing from the fountains is both clear and beautiful, not that nasty toxic green sludge at most amusement parks. Along both walkways, are a variety of shops and restaurants all leading up to the 1/3 scale replica of the Eiffel Tower, which looms impressively in the distance. The kinetic energy of the area is quite outstanding and serves to immerse visitors in the park much like a Disney-style Main Street, though on a lesser scale. I was very impressed with International Street. We took some pictures near the “Kings Island” sign with the Eiffel Tower in the background, then headed into Skyline Chili for lunch. 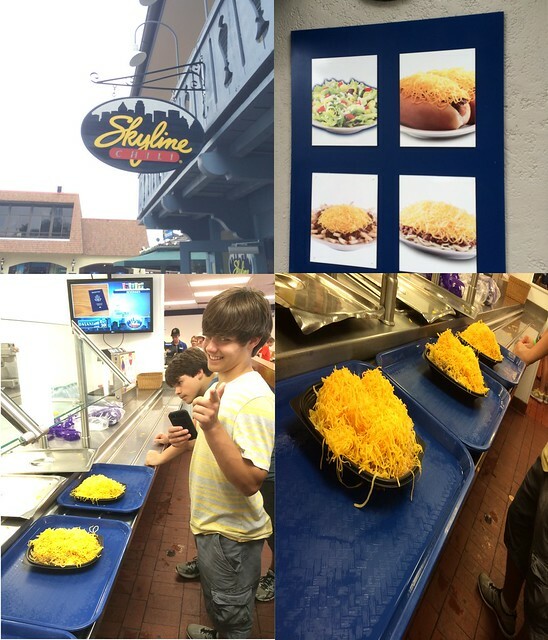 I do like the fact that Kings Island has some local flavors unique to their park, such as Skyline and LaRosa’s, so I definitely wanted to give them a try. For the six of us we ordered three “3-Way Specials” which included chili, a chili dog, and a drink. It was a ton of food, and really, a ton of cheese! The chili is interesting in that it has a distinct, but not over powering cinnamon taste and is served over spaghetti noodles and covered in a mound of grated (Cheddar/American?) cheese. Now, I am used to chili and rice, and a bit of cheese, but Skyline’s version is a bit overwhelming. Still, we didn’t hate the food, and with a little less cheese and some Tabasco, it would have been very good. Even as it was, we enjoyed lunch, enjoyed the interesting flavors, and enjoyed the quantity of food we received for just under $40. Not bad for an amusement park! Incidentally, the hot dog was really small, and had the same chili and mound of cheese, just no pasta. The kids liked the hot dogs better than the chili, but overall everyone ate well and we were full when we left. We headed across International Street to Graeter’s, another local place, this one serving some delicious ice cream, which reminded me of, and I mean this as a compliment, Baskin-Robbin’s, very rich, very flavorful, very good. I ordered a scoop of Dark Chocolate Truffle Gelato and a scoop of Black Raspberry Chocolate Chip. Yum. Delicious. Satiated, we headed to the Planet Snoopy area and rode both Woodstock Express and the Flying Ace Aerial Chase coasters. Woodstock Express is a decent youth wooden coaster, similar, I think, to the Ghoster Coaster (is it still called that?) at Kings Dominion. Definitely worth a ride. Flying Ace is a youth inverted coaster which park attendants call Baby Banshee. It’s also a decent ride for those too short or too scared to ride the real deal. In fact both coasters are very good youth options. I would like to see more installations of these types of coasters at other Cedar Fair parks. They are a great way for kids to slowly develop their love of roller coasters. I approve. On the way out of Planet Snoopy we rode Boo Blasters on Boo Hill, a basic dark ride/shooter. Sadly two of the three guns in my ride vehicle were pretty much inoperative, so I just sat back and looked at the theming. It’s not horrible, and almost any dark ride is better than none at all, but obviously Kings Island hasn’t spent a lot of time or money keeping this attraction up to snuff. Too bad. I hope Matt Ouimet, the President and CEO of Cedar Fair, really pushes a dark ride agenda, because even amusement parks need at LEAST one people-eating dark ride, and it should be better than Boo Blasters on Boo Hill. All of coasters out of the way, we headed back to the center of the park and took the elevator up to the top of the Eiffel Tower. It is a quick ride, and worth the time just to get some amazing photos of the park. I definitely recommend folks take a little time out to explore this attraction, as the views are excellent. We spent the rest of the day (until it started to rain around 6pm) re-riding our favorite coasters (sadly, Firehawk did develop a 45-minute wait so we did not get any re-rides on it this visit), a few of the flats (Delirium was the one stand out), and the train. To be honest, I pretty much enjoyed every coaster at KI, and we rode all of them except the Great Pumpkin Coaster as it is just too kiddie. In my book it does not count as a coaster credit. In fact if you, as an adult, ride that coaster without a small child of your own, your coaster count should be decremented by at least a dozen points. Taking a seat away from the dozens of little kids waiting to ride is unconscionable. Just stop, Coaster Boy, stop! Anyway, KI has a solid and diverse selection of coasters, and they are all in good shape. After the rains came, we hustled out of the park and decided to eat at Smashburger (I love Smashburger, it is my favorite “fast food” burger joint) for dinner. What I really like about Smashburger is they always have a local burger recipe on the menu. For this location, the local burger was the Buckeye with fried pepper rings, cheese, haystack onions, lettuce, tomato, and mayo on an egg bun. I am not a huge fan of mayo, but the burger was delicious. And those rosemary fries…yum! You really can’t go wrong with Smashburger. Now we are back at the hotel after a very satisfying day. The kids are swimming, and I am writing. I hope you all don’t mind me going from present tense to past tense like I am, but I want to jot everything down while the memories and the euphoria of the day is still fresh. Anyway, it is getting late and we have another full day at Kings Island tomorrow as well as a 3+ hour drive to Sandusky. Time for some shut eye. Good night. Our visit on Tuesday to Kings Island started out pretty much the same, with Early Ride Time on Banshee. However, this time as we toured we spent extra time on our favorite coasters (Banshee, Beast, Diamondback, and Firehawk), re-riding as long as the lines were short. Over the course of the day, we rode every coaster in the park (except the youth coasters) multiple times. It was a beautiful day, crowded, but not out of control, and once again the ride ops were absolutely on fire. One side note, on our re-ride of Flight of Fear today, they remembered to turn off the lights in the main part of the course, and the ride was MUCH better. Darkness and coasters go together like chili and cinnamon…errr…I mean like chocolate and peanut butter! For lunch we stopped at LaRosa’s in Rivertown, near Diamondback. Another local flavor, we ordered two large cheese pizzas and water to drink. I thought the pizza was pretty good – definitely a step or two above chains like Pizza Hut and Dominos, but not nearly as good as some of our favorite pizza places back home, such as Original Pizza (in Blue Springs, Missouri) or Minksy’s (various locations). 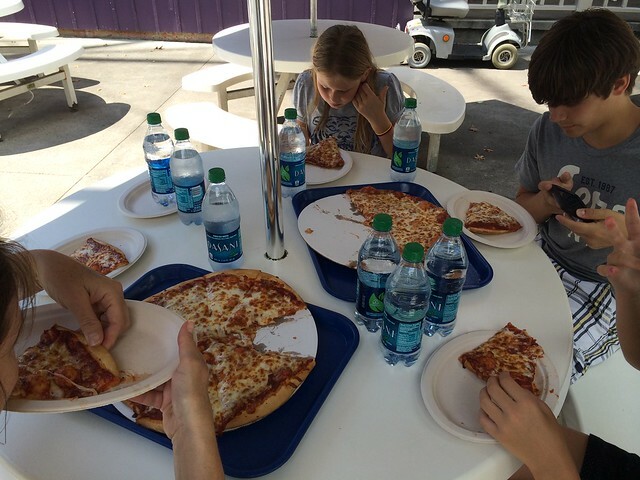 Still, for about $50 (not great but not horrible) I fed six people at an amusement park, so I am not complaining. At 2:30 we headed to the front of the park to the Kings Island Theater to see Cirque Imagine, an acrobatic showcase of strength, balance, and athleticism. It was a pretty good show, on par with what you would expect from a “cirque” style act, but not up to the quality of the shows we’re used to at places like Silver Dollar City or Dollywood. Still, for a Cedar Fair park, I am standing and applauding. It is definitely a step in the right direction. After the show we grabbed a couple more rides on Banshee and bid farewell to Kings Island. I can honestly say that if Kings Island was my home park instead of Worlds of Fun, I wouldn't need to take as many trips as I take to visit other parks. Sure, I would still visit Orlando and Anaheim for that unique Disney experience, but my thrill park needs would be wholly satisfied because Kings Island is a tremendous amusement park. One of the best I have visited. It's clean, organized, well appointed, and filled with great rides. The employees are friendly and excited, and the guests, for the most part, are well behaved and nice. It is a professionally operated park, which seems to pride itself on getting as much throughput as possible on its coasters. 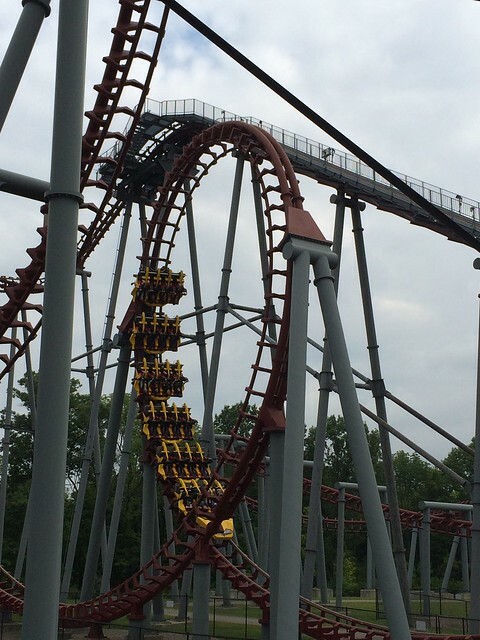 If you have not visited Kings Island, or it has been awhile, then make some plans. As far as the Rao Family is concerned, this park is truly a vacation destination in its own right. August 28, 2014 at 5:35 AM · King's Island was always one of my favorite parks. We would take the 5 hour drive from Pittsburgh and generally stay for three days. At that time, in the 80's, the park was highly themed, and was really more like a Disney Park, although it did have a number of coasters. They had a huge Safari ride similar in size to Kilimanjaro Safari at AK. They also had lots of high quality shows and entertainment. August 28, 2014 at 6:16 AM · Sounds excellent, Rob, I would have loved to have visited then. As it is today, the park is still a notch or two above most amusement parks when it comes to decorative touches. KI is definitely an amusement park for Disney and Universal fans who want to take a year off their Orlando adventures and sample some attractions with a bit more "muscle" than normal. August 28, 2014 at 9:23 AM · James, I wish you could have rode Phantom Theater in its glory days before it was converted to Scooby-Doo and the Haunted Castle and then Boo Blasters on Boo Hill. Boo Blasters has gotten sadder and sadder with each passing year. The FUN TVs in the queue aren't doing much to help the atmosphere either. Kings Island is a very well maintained and run park now to be sure but I definitely miss when the place was more about theme and diverse attractions like the Wild Animal Safari. It felt more in line with Busch Gardens Williamsburg in some ways, whereas now it is more like Cedar Point. That's not to say one is inherently better than the other, just different tastes I suppose. August 28, 2014 at 9:27 AM · Glad to hear you had a good time. Unfortunately, rides like Flight of Fear and The Bat have shed some of their paramount themes. The Boo Blasters used to have a Scooby theme. Flight of Fear used to have more going on in the queue. The Bat used to be Top Gun, and the loading station was built like an aircraft carrier. Believe it or not, there was a time when that long queue was full. 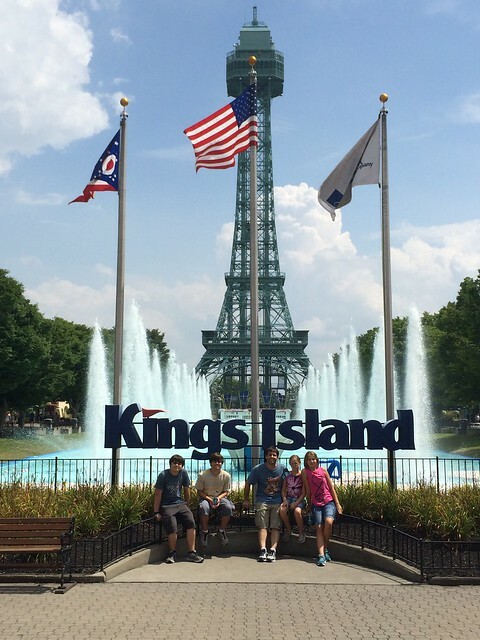 August 28, 2014 at 4:10 PM · I've been to pretty much all of the major Cedar Fair parks (World's of Fun is the largest I haven't visited), and Kings Island is probably my second favorite after Cedar Point. The park has a decent collection of coasters, a decent dark ride, a better flat ride collection than many parks, and one of the best kids areas I've seen anywhere. In addition, the park was well landscaped and decently themed, and the employees were better and faster than those at many other thrill parks. Glad to hear you had an enjoyable time there, and it sounds like you managed to fill over two days without running out of stuff to do (which I thought sounded like major overkill). I can't wait to hear what you thought about Cedar Point. August 28, 2014 at 4:35 PM · AJ, we had no trouble finding things to do. Unlike Worlds of Fun which is a half day park (at best), Kings Island had plenty to keep us entertained. We were combating rain some of the time which shortened our exploration, but for the most part we had the run of the place and enjoyed every minute. Our coaster rankings are similar, just a few changes: Banshee, Beast, Diamondback, Firehawk, Backlot Stunt Coaster, Flight of Fear, Racer, Bat, Vortex, Adventure Express, Invertigo, Woodstock Express, and Flying ACE Aerial Chase. Regardless of the order, that list is a really nice collection of quality rides.